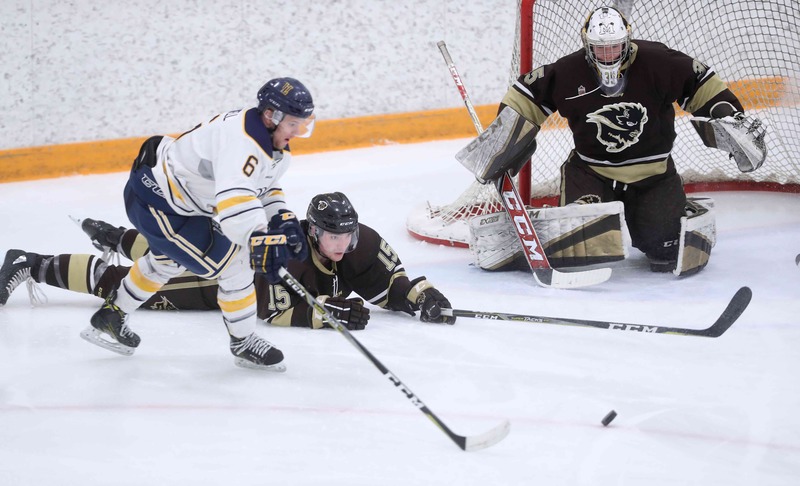 The Bison men’s hockey team looked to establish itself as a contender heading into the second half of the Canada West season, as they took on the top-ranked Alberta Golden Bears in a pair of games this past weekend. First in the nation according to the CIS rankings, Alberta entered the weekend enjoying a 10-game winning streak. 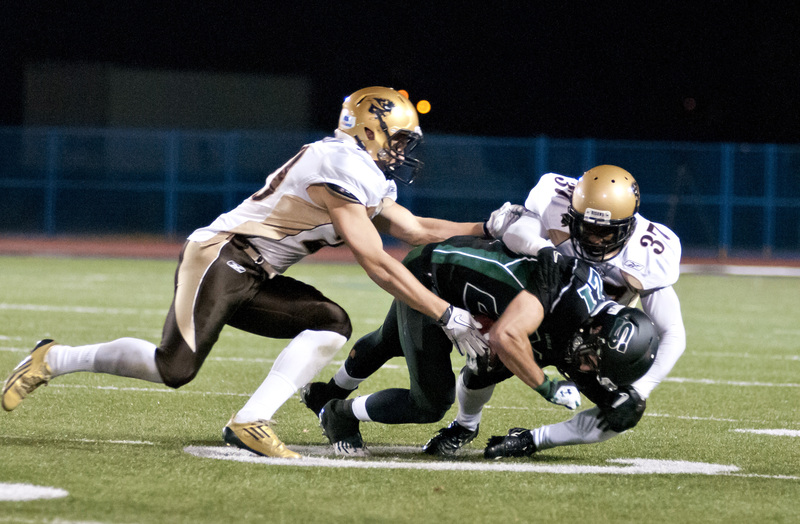 Meanwhile, Manitoba broke into the CIS top-ten rankings with an impressive showing against Regina last weekend. 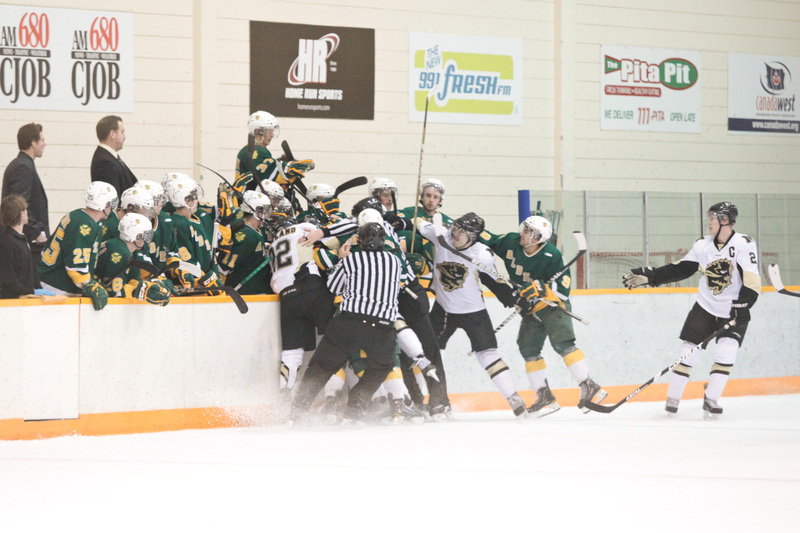 The Bisons were hoping to move up in the rankings by proving themselves against a very good Golden Bears team. The weekend series kicked off Friday with a game where 17 minor penalties were called. All of those penalties would result in seven power-play opportunities for the Golden Bears, and six for the Bisons as both teams were only able to find the scoreboard with the extra man. Alberta scored the game’s opening goal, as Winnipegger Johnny Lazo flicked a backhand shot past Bison goalie Jesse Deckert low blocker side, increaseing his Canada West leading point total to 23. In the second period the Bisons tied it up with the extra man, as Matthew Lowry knocked in a rebound for his fourth of the year. Numerous calls in this frame drew the ire of the Bisons bench and the 367 in attendance at Max Bell Centre. The third period saw more power play goals, as Alberta was questionably awarded a 5-on-3 advantage that led to a Torrie Dyck goal. With 8:43 left to play Lowry pounced on a rebound to tie things up via another power play goal, and this game would need extra time to settle things. The 4-on-4, and then 3-on-3 overtime periods would solve nothing so the game went to a shootout, where Manitoba managed just one goal from Matthew Lowry compared to the Golden Bears’ two from Johnny Lazo and Sean Ringrose as Alberta prevailed 3-2. It was the Bisons’ second shootout loss of the season, with the first coming in October at Calgary. Manitoba was two-for-six with the extra man, while Alberta was two-for-seven. Bisons goalie Deckert saved 33-of-35 shots, while Alberta’s Kurtis Mucha stopped 29-of-31. After managing to hold the top ranked team in the nation to a shootout, the Bisons looked hungry for victory on Saturday. Yet again special teams would be in the spotlight, but it was the penalty kill of the Bisons that would open the scoring in this one. After a solid defensive play in their own end, Blair Macaulay and Ian Duval broke out for a 2-on-1 rush, where Macaulay fed a saucer pass over to Duval who tucked it behind Alberta netminder Real Cyr. The Golden Bears would control most of the period, taking a 9-5 lead in shots into the first intermission, but it was the Bisons leading 1-0 after 20 minutes. The second period saw both teams looking to grab the all-important second goal of the game. The Bisons saw three power play opportunities fall by the wayside, while the Golden Bears would capitalize on one of their own when Sean Ringrose scored with less than a minute left in the period to make the score tied after two. The two teams traded punches in the third. Ian Duval notched his second of the game, giving him 19 points on the year and putting him among the top ten point leaders in Canada West. Ben Lindemulder would tie the game up on the power play and once again it looked as though this game could see overtime. However, just 11 seconds later Blair Macaulay snapped a laser beam into the top left corner to restore the Bison lead. Travis Bobbee would add a fourth on the power play, as a knuckleball of a shot eluded Cyr. Alberta would pull their goalie with over two minutes to play, but the Bisons prevailed 4-2 to end Alberta’s winning streak at 11. Bisons goalie Jesse Deckert allowed four goals on 64 shots in the series, all scored with the man advantage. The Bisons finish the first half of the season sitting in third place in Canada West with a 9-4-3 record, which gives them 21 points. They next play in Saskatoon against the Huskies on Jan. 4–5. The team returns to Max Bell Centre the following week against Mount Royal University.